Woolwich Township is a 21-square-mile community located in western Gloucester County. Historically, it has been a rural, agricultural community with little pressure for change. Between 1930 and the mid-1980s, it maintained a relatively stable population below 1,200. This began to change in the 1980s, a decade that saw the township’s population grow by nearly 30 percent. Since then, Woolwich’s population has boomed—first doubling to more than 3,000 by 2000, then tripling to an estimated 9,000 at the end of the decade, making it the fastest-growing community not only in New Jersey but in the entire Northeast. Township leaders, recognizing that Woolwich had become a victim of sprawl development, worked to develop a plan that would enable the community to maintain both its rural character and agricultural viability. The plan—to preserve more than 4,000 acres, in exchange for just over 700 acres of development—came about through a collaborative process that included citizens, developers and county, regional and state government entities. All interested parties came together in a series of workshops to design a road network that would have minimal impact on the already stressed system. At the same time, the parties worked to ensure that the development had minimal impact on the environment. The collaborative process resulted in a comprehensive plan that was acceptable to all. In 2005, Woolwich, along with six other communities, was selected as a Transfer of Development Rights (TDR) Demonstration Project by the Office of Smart Growth (OSG). Four years later, Woolwich was the first community to adopt a TDR Plan and ordinance. Woolwich’s TDR Plan includes center-based design that is functional and more economically viable than the predominant sprawl pattern of development. It includes a mix of uses—residential, retail and office—and a variety of housing types. The plan incorporates a grid network and other pedestrian-friendly features that will make the new community oriented to the human rather than the automobile. It makes use of integrated and regional stormwater management systems that also function as green amenities. 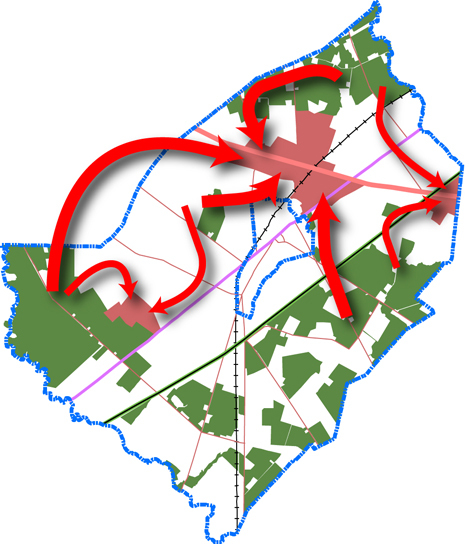 The primary receiving zone was chosen for its proximity to the historic main street of Swedesboro (a 0.8-square-mile borough completely surrounded by Woolwich), Exit 2 of the New Jersey Turnpike, the Kingsway Regional middle and high school campus and a site designated for an over-55 community. Bald eagle habitat to the south is protected with a green buffer. Part of the receiving zone includes a one-square-mile “Woolwich New Town” based on traditional neighborhood design principles. Its pedestrian-scale, mixed-use main street will connect it to downtown Swedesboro, helping to reinforce both places. Net densities of 15 to 28 units per acre will ensure that 20 parks and public spaces, as well as main street destinations, are within easy walking distance of virtually all homes in the receiving zone. Pedestrian-friendly intersections and a wide landscaped median will enable people to safely cross busy Route 322, the main east-west highway in Gloucester County. A dedicated lane along Route 322 will open up future opportunities for bus rapid transit in this region. A second receiving zone is located adjacent to Weatherby, a 4,500-unit planned development approved in the late 1990s to be phased in over a 20-year period. The development, which calls for 97 percent residential and 3 percent commercial, will ultimately include a mix of apartments, townhouses, single-family homes and age-restricted units, two schools, 250,000 square feet of retail and office space, parks and municipal buildings. The sending zone comprises 4,100 acres of farmland, open space and woodlands. By connecting these resources to existing parks and preserved farms, Woolwich Township’s environs will be knitted into large, contiguous blocks of undeveloped lands that support agriculture, enhance habitats and offer scenic vistas.